Heat the olive oil in a saucepan. Sauté the finely chopped onion and garlic. Slice the cuttlefish (without the tentacles!!) into small bits and add into the pan. Cook on medium heat until lightly golden and add the rice. When the rice is clear,start drizzling it with the broth and cook until you get a sticky mixture. Aside, mix the ink with the vinegar and butter and add into the pan. Season with salt and pepper according to your taste. Heat a tablespoon of olive oil in a separate pan and add the tentacles. Cook for a minute or two and serve with the risotto. You can also add a bit of chopped parsley or Parmesan. 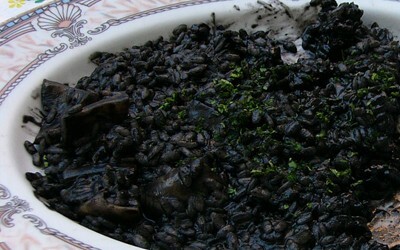 Black cuttlefish risotto is a dish which you will see on all menus along the coastline from Istria to Dubrovnik. It is a dish with a special flavor which will captivate your taste buds.